Articles Chocolate chip starfish: reef safe? Chocolate chip starfish: reef safe? 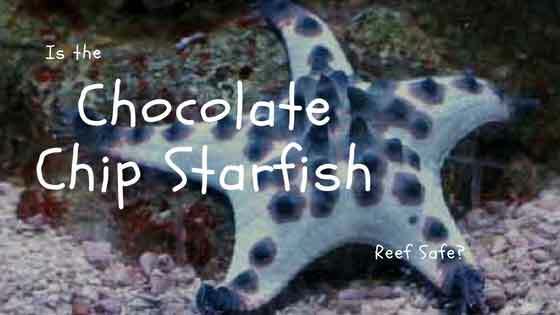 Chocolate chip starfish are quirky-cool and easy to identify, but are they reef safe? That’s the question I set out to answer with this blog post. So, what is a chocolate chip starfish, anyway? As you can see in the picture above, the chocolate chip starfish is a star-shaped marine invertebrate that gets its name from the fact that its skin is tan, like the color of chocolate chip cookie dough, complete with darker brown raised areas that look like the chocolate morsels that make the namesake cookie so delicious. Although they are more commonly found in tan to brown coloring, you may see specimens with red, gray or even blue coloration. While they may look like a tasty confection, they are animals, in the Echinoderm Phylum. Interesting sidebar here–did you know that the word “echinoderm” comes from ancient Greek and means hedgehog skin? Hahaha. that makes me laugh. Let’s hope that question comes up at Quizzo, so one of us can impress our friends. A lot of the cool and funky-looking mobile natural reef invertebrates are echinoderms, including urchins, sea cucumbers, sand dollars, and of course, the sea stars. Where does it come from and where is it going? The chocolate chip starfish is commonly found in lagoons, mostly, throughout the Indian Ocean, Pacific Ocean, and the Red Sea. These ornamental beauties appear most commonly in the shallow sandy areas of the lagoon environments, but they also occasionally occupy deep reefs or in muddy grass beds, as well. Which basically means, they would likely be able to adapt to just about any reef tank environment you could throw at it. Which begs the question…why are you throwing reef tank environments at sea stars? Ok, you’re right–it would be really difficult to throw any reef tank environment, but hopefully, you get the picture. Chocolate chip starfish are opportunistic scavengers. Which means, they will take the opportunity to eat whatever they want, if they get a chance. According to the Atlantic City Aquarium, this sea star’s diet consists of corals, shellfish and clams, sponges, detritus, and decaying plant or animal matter. That basically means…it eats anything it can catch…or I guess crawl over. So if you have any of those things in your tank, this might not be the best invertebrate to add to your tank. 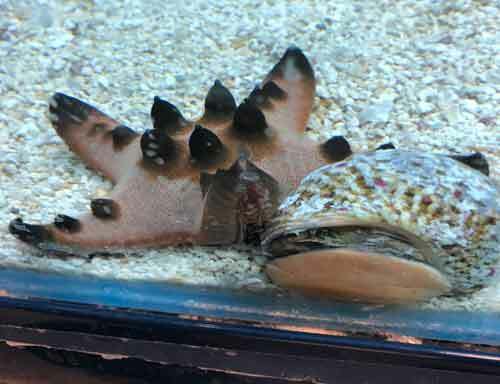 Watching a chocolate chip starfish eat, while stuck to the front aquarium glass, is one of the coolest things you will see in this hobby because starfish (or is it starfishes) eat by sending their stomachs outside of their bodies to digest their food. Look closely at the center of the starfish pictured above. The little white filaments are the tiny legs that the starfish uses to walk, and the yellowy-orange flowy stuff in the center is the stomach. It protrudes out of the opening on the bottom, envelopes dinner, digests it and then pulls its stomach back inside. Cool, right? No, not just cool, aweirdsome (TM). Since a chocolate chip starfish might try to snack on your non-moving marine invertebrates, they are NOT considered to be reef safe. Hopefully, this is not a surprise to you, at this point in the article. Therefore, the best option would be to keep this in a species-only tank (that would be boring, wouldn’t it?) or perhaps an otherwise fish only tank. Ok, well, at that point, it wouldn’t be a fish only tank. 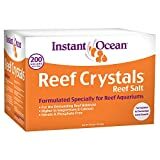 But I guess the more precise description would be to keep it in a tank that doesn’t have any decorative sponges, clams (or other shellfish), or corals. There are some reports that this sea star is thought to be okay with other faster-moving invertebrates, like hermit crabs, etc. Also, it is not recommended to keep this echinoderm with fishes or invertebrates that enjoy crunching up stars –puffers, parrotfish, triggerfish, or harlequin shrimp. I haven’t read anything about there being incompatibility with hawkfishes, but I know hawks will obliterate other inverts. Probably not worth the risk there (unless someone knows the answer and can post that below). Besides that, a chocolate chip starfish is largely compatible with other major fish species that don’t consider it a meal. Admittedly, I did have a chocolate chip starfish years ago. It was one of those ill-advised, poorly researched, spontaneous purchases. I used to really enjoy feeding it a piece of fish, shrimp or scallop, while it was hanging on the front aquarium glass. I would extend the piece of meat (a piece big enough for me to pinch but just a fraction of the size of a dime (in the US, or 5p in U.K.) as close to any part of the starfish I could reach, and within seconds, the echinoderm would sense (smell?) the food and move over it–first with one leg, until the food was directly under the middle. At that point, the stomach would come out, engulf the food, and chow down. I don’t recall seeing any major problems with this well-fed sea star. I did catch him a few times, ‘with his stomach out’, trying to eat something (a coral) I didn’t want it to. But, buyer beware, your individual results may vary. You’ll be pretty bummed if yours does acquire a taste for the expensive corals in your tank. 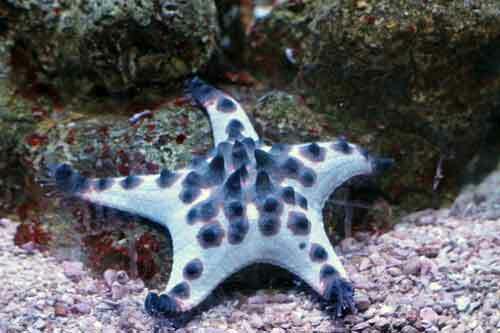 It’s also interesting to point out that this starfish is an attention magnet. Kids and guests loved seeing him/her in my tank. The chocolate chip starfish doesn’t require all that much to be happy in your tank. Occasional feedings of a meaty seafood by hand will be fun for you and nutritious for your echinoderm, but are probably not necessary. It all depends on how much cleaning up your clean-up-crew needs to do. 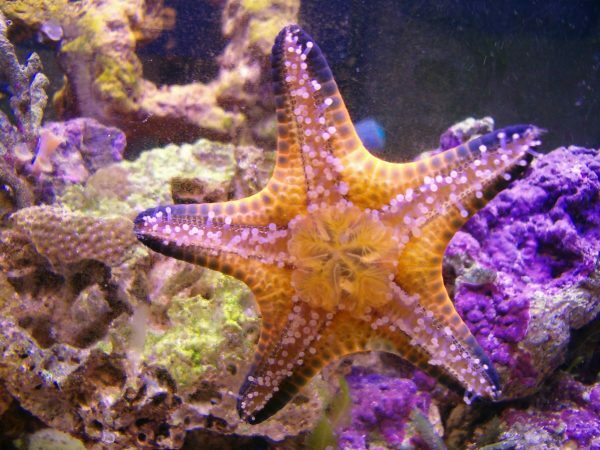 Standard reef aquarium water parameters are perfect for this starfish, too. Take care to try and avoid rapid swings in water parameters and keep nitrate levels down (which is a best practice for any reef tank). 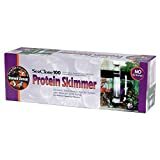 It is generally recommended to acclimate livestock that you have purchased locally (eg. have not received via overnight shipping), with the drip method. The basic premise is that you get the starfish used to the tank conditions by slowly dripping aquarium water into a container (with the starfish in it). You can learn more about that method here. Please note that if you receive one via mail order, you should follow the acclimation procedure outlined by them, to be sure any warranty/guarantee applies. In conclusion, the chocolate chip starfish is an attractive, interesting reef invertebrate that you can train to take food from your hand. Kids and visitors will drool over it. Your mind will be blown when you see its stomach outside of its body. But the downside is that this tricky little eater may choose to snack on your prized coral or clam…which will instantly make it much less popular in your mind. So, it is with a heavy heart that I conclude–this invert is truly best suited for the fish-only aquarium with fishes large enough not to be swallowed. Once upon a time, I didn’t follow the advice that I’m giving you now, and my tank lived to tell about it–but from what I’ve read, I may have been in the minority. Could be the “STAR” of the tank. ah-ha! well played, Peter! You are stellar at puns! Copyright 2009-2019 SaltwaterAquariumBlog.com. This site participates in the Amazon Associates Program, an affiliate advertising program designed to provide a means for sites to earn advertising fees at no additional direct cost to you by linking to some products on Amazon.com.